Davis is a highly selective campus and the extraordinary size and strength of our applicant pool means that we are not able to admit many qualified candidates. Get answers to some of our most commonly asked questions and learn about options for future admission to UC Davis. I met the UC admission requirements, but wasn't admitted. Why is that? Meeting the UC admission requirements qualifies you for admission to a UC campus, but does not guarantee admission to any specific UC campus. 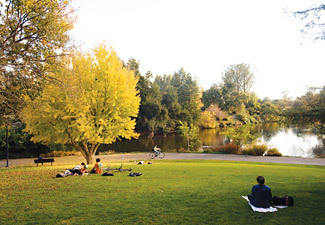 UC Davis uses a comprehensive review process to select students from its applicant pool. Due to limited enrollment space, applicants who were admitted generally exceeded UC admission requirements. Qualified California residents who are not admitted by any UC campus to which they have applied may be offered freshman admission by another UC campus. How did UC Davis determine which applicants to admit? At UC Davis, every application receives a thorough review by trained staff in a comprehensive review process. This process is used by all UC campuses and considers a broad variety of criteria to assess applicants. Of these factors, the strength of an applicant's high school academic record is the single most important component. Other considerations include standardized test scores, the rigor and number of “a-g” courses taken, breadth of coursework completed and academic improvement from the 9th through 11th grades. Additional considerations include leadership, special talents and accomplishments, and response to life challenges. UC Davis only accepts applications for fall quarter admission. What options are available to me since I was not admitted to UC Davis? You should strongly consider admission offers from other UC campuses or institutions that you may have already received. You may also consider transferring to UC Davis from a community college. Attending a community college can be an excellent way to build academic skills, prepare for your major and save money. If you plan to transfer to UC Davis, we strongly encourage you to work with the transfer center or counseling office at your community college to develop an academic plan that will prepare you for a successful transfer. While we consider junior-level transfer applicants from all colleges and universities, we give special priority to transfers from California community colleges. By signing a UC Davis Transfer Admission Guarantee (TAG) with a California community college, you can guarantee your admission to UC Davis at the start of your junior year! Appeals are rarely granted. Consideration for appeals is based on new and compelling information, extenuating circumstances and your overall academic record. As part of your appeal, you must include a statement describing your special circumstances, as well as any additional documents such as unofficial academic records and letters of recommendation. All appeals and supplemental documentation must be submitted online—interviews are not granted and appeals received through any other channel will not be considered.